[S1302] 1821 Dennbawn, Denn Parish, County Cavan Irish Census, Dublin, Family History Library, MF#597155. [S2094] Westbranch Family Tree/John Schaad, "Robert Ambrose and Bridget Family Group Sheet", Accessed May 9, 2015. [S308] Pasadena Star-News, Nov. 14, 1981, Saturday. Marriage*: Elizabeth (?) married Jacob Beder. [S629] Survivors and Rescuers, Chicago's Awful Theater Horror, p. 145. Married Name: Her married name was Hallaran. Marriage*: She married Michael Hallaran. [S275] 1880 US Census, Washington, DC, ED 33, page 386C, Ancestry.com, accessed August 19, 2016. [S1185] World War II draft registration card for Daniel Joseph Egan , Draft Board, Chicago, Illinois. [S1187] Chicago Tribune, November 28, 2006, page 11, GenealogyBank.com, accessed April 22, 2010. 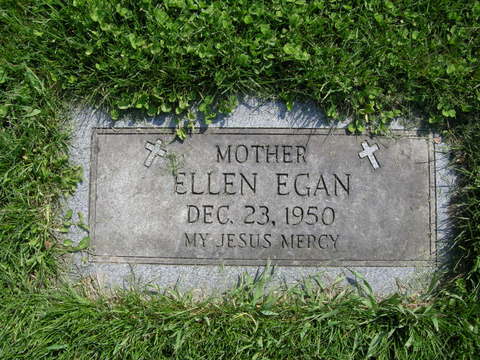 [S747] Illinois Statewide Death Index (1916-1950), online http://www.sos.state.il.us/GenealogyMWeb/idphdeathsrch.html, Ellen Egan, Certificate number 6090472, accessed April 22, 2010. [S1188] Daniel J. Egan cemetery record, Holy Sepulchre Cemetery, Alsip, Illinois. 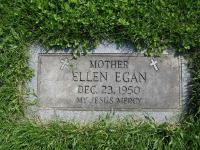 [S1186] Catherine F. Egan cemetery marker, Holy Sepulchre Cemetery, Alsip, Illinois. [S634] June 12, 1900 US Census, Illinois, Ogle County, Dement Twp., Creston Village, Washington, DC, ED 76; Page 9A, Ancestry. com; accessed March 11, 2006. [S633] Chicago Tribune, August 17, 1959, Chicago Tribune Historical Archive; Record Number 19590817dn052, Accessed on line March 11, 2006. [S876] 1930 US Census, Illinois, Cook County, Chicago, Washington, DC, ED 850; Page 16B, Ancestry.com, accessed January 13, 2009. [S309] US Social Security Death Index, 1935-Current, Ancestry.com, ssdi.rootsweb.cancestry.com, accessed January 13, 2009.